We’d planned to go to Earl of Sandwich for dinner as we often do on arrival day, but a rather lengthy check-in process at the Grand Floridian and switching rooms twice left us feeling underwhelmed at our decision to stay there – something we’d been wanting to do for ages – and we needed some magic NOW! So we wandered down to the lobby and were able to get a walk-up reservation at 1900 Park Fare for Cinderella’s Happily Ever After dinner. 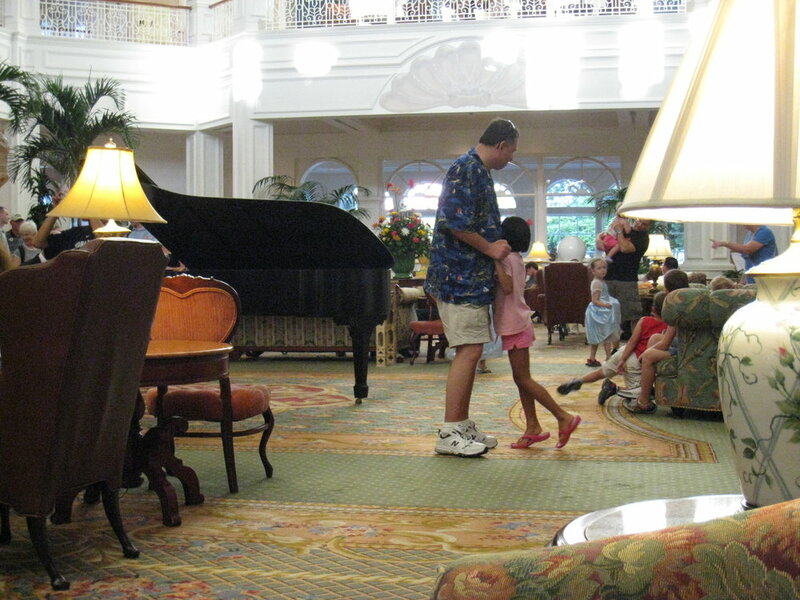 Sitting in the Grand Floridian’s lush lobby waiting for our name to be called helped ease the frazzled nerves and included some Daddy/daughter dancing to the sounds of the grand piano playing highlights from our favorite Disney movies. As usual, good food calmed the savage beasts and we were laughing and talking and back to our happy Disney selves when MiaMouse suddenly reached over and grabbed my arm. “Mommy, it’s Prince Charming!” She wiggled and squirmed, waiting as patiently as she could to meet the handsome Prince and finally it was her turn. Prince Charming walked up to the table, bowed, and held his hand out. MiaMouse gave him her hand and he kissed it! She was mesmerized. After all, the only man that had ever kissed her hand before was Daddy! The smile on her face lit up the room and though she told Prince Charming she couldn’t marry him because he was marrying Cinderella and she was marrying Daddy, she’ll always remember how her treated her. That, my friends, is Disney Magic!